If you had your first baby this year, there’s a good chance your New Year’s Eve plans are going to look pretty different from last year. Staying up super-late, drinking, hangovers… they’re not quite as appealing once you have a tiny (early-rising) kid. 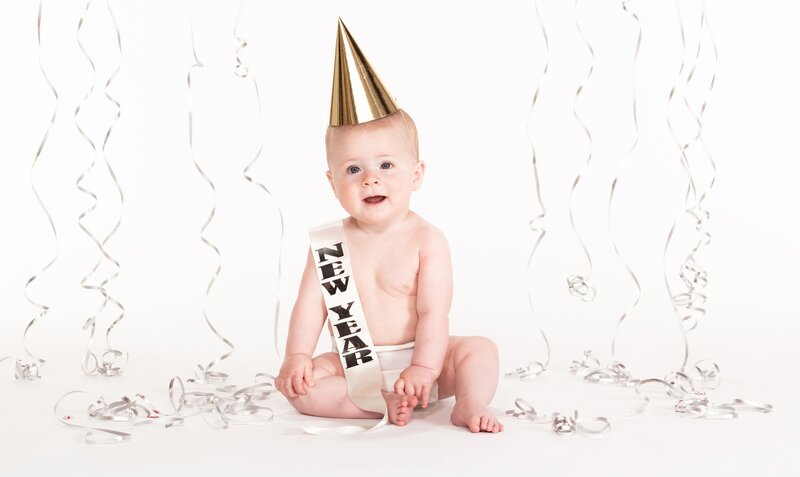 But just because you don’t feel like taking your baby to a chilly NYE ball drop doesn’t mean you can’t celebrate. There are plenty of other ways to have fun, make New Year’s memories and keep yourself and Baby happy. Here are some of our favorite ideas. Unless you can spend a fortune on a babysitter — or have a family member in town who’s willing to watch the baby for free — you’re better off staying in to watch Ryan Seacrest ring in the new year in Times Square. (But did you really want to go to Times Square anyway? Ugh, crowds.) But you can make your TV NYE more interesting by planning a fun menu to cook with your partner or friends — just make sure to practice safe babywearing around the kitchen — and have some board games to play while you cozy up and watch all those Times Square folks freeze their butts off. Invite other parents and kids over for a casual potluck/early cocktail party/New Year’s gathering. Provide paper for the adults to write two lists: one list of what they’d like to accomplish in the coming year and one of what they’d like to let go. You can then tear the papers up or burn them in a fireplace. Any kids who are old enough can participate too. This is a fun way to mark the holiday with meaning — without having to stay up late. Plenty of babies can tolerate a short meal in public without too much fuss. Plan an early dinner (well before bedtime) at a favorite restaurant. You can even go bold and try a fancy new place; if you’re nervous, call beforehand to ask if they accommodate infants. Just make sure to give your baby a nap and a clean diaper right before the outing so they’re good to go. If you really, really want to go out to a party, consider bringing your little one with you. Of course, it depends on the party (skip the rave this year, OK?) but it’s probably totally fine to bring your baby to a gathering at a friend’s home where there will be food, drinks and celebration. It’s a big plus if the host has a secluded area where you can breastfeed or lay your baby down early. Believe it or not, you don’t have to be awake at midnight to celebrate the new year. Instead, consider going to bed early and celebrating on New Year’s Day instead. Going out to a special family brunch or having friends over for appetizers and cocktails the next afternoon is a great idea. That way, you’ll have something fun to look forward to — and going to bed at an earlier hour won’t seem so lame. Also, you can’t beat waking up on the first day of the new year refreshed and hangover-free, right?